If hungry deer frequently mistake your garden for a salad bar, you may want to consider a few measures to deter them. Here are some options for minimizing deer damage this fall. Pick Deer-Proof Varieties - Deer aren't fans of prickly, smelly or thorny plants (except roses! ), so choose varieties that have those characteristics. Whether you're looking for perennials, ornamental grasses, shrubs or another plant type, you've got options. Bee balm, switchgrass and boxwoods are just a few effective examples. Throw Deer off the Trail - If you have plants such as roses that you don't want to part with, try disguising their fragrance with garlic, mint or lavender. Some people even scatter mothballs, fabric softener or decaying fish heads to deter deer with strong odors. Keep Prized Plants Close - Deer tend to feed in the early morning or twilight hours, so you may not always catch them in the act. To keep better watch over your favorite plants, bring them closer to your house and within view of a window. Build a Barrier - Fencing is probably your best bet for preventing deer damage. Because deer are jumpers, you may need a barrier that's 8 to 12 feet tall, but don't let that deter you. Many ideas can enhance your home's curb appeal, like incorporating a pergola or adding wood framing to a mesh fence. 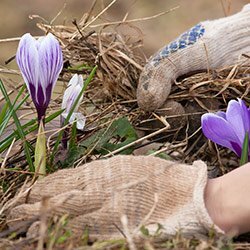 Swap Fall-Planted Bulbs - Fall is the season for planting bulbs that lead to beautiful spring blooms. And while tulips often top most homeowners' wish lists, they're also a favorite with deer. Swap them for daffodils, snowdrops and snowflakes, which contain a toxic alkaloid that deer can detect and avoid. Deer don't have to ruin your landscape. If you garden with these simple measures, you'll likely be pleased to find them dining elsewhere this fall.